I hesitate to call it a routine, because the days when I put on makeup are few and far between. But lately, those days have been more frequent than usual, so stick with me for the sake of the title. There was a day, not too long ago, when I had no idea how to apply mascara. (Or anything else, for that matter!) I've come a long way since then, even if some of you may laugh at what I consider to be a lot of makeup. 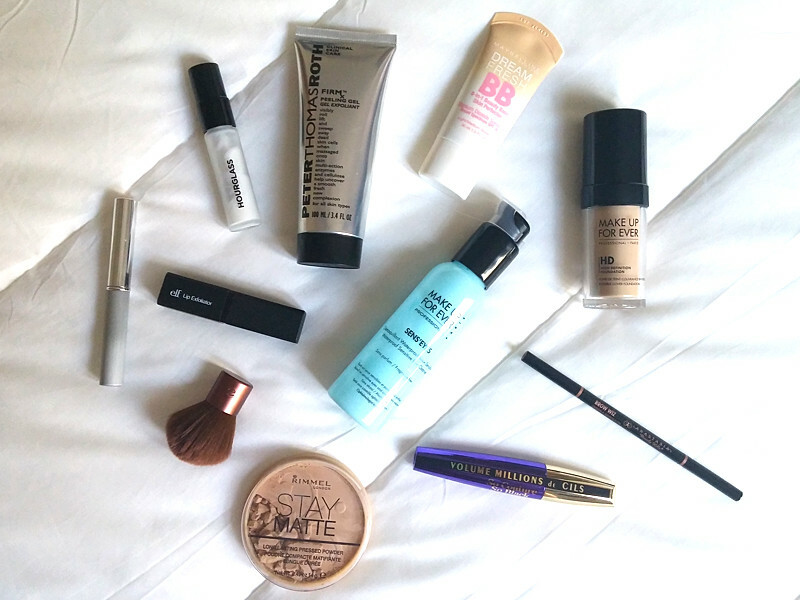 With the exception of chapstick and an eyeliner pencil that I very rarely use, everything I own is pictured above. Because I work in a semi-hot kitchen, I don't wear any makeup on the days when I work. This is both a blessing and a curse; a blessing because I don't have to worry about spending time in front of the mirror before work, but a curse because I'm never going to get this makeup thing down if I only get to practice once or twice a week! So on my days off I usually wear something, even if it's just BB cream and mascara (which it usually is), just to get some practice. Peter Thomas Roth FIRMx Peeling Gel: This product is amazing. I picked it up over a year ago after one of the girls at Sephora recommended it to me - if you have combination skin and notice a lot of flakiness around your nose and mouth when you apply your makeup, this is a game-changer. Hourglass Veil Mineral Primer: Also recommended to me at Sephora. I'm not really sure what primer does, but I use it when I remember to. Maybelline Dream Fresh BB Cream: I was looking for a new BB cream when my old one ran out and a friend recommended this one. I'm still not totally satisfied with it, but I'm also not sure if BB cream is what I want after all. This will do though! 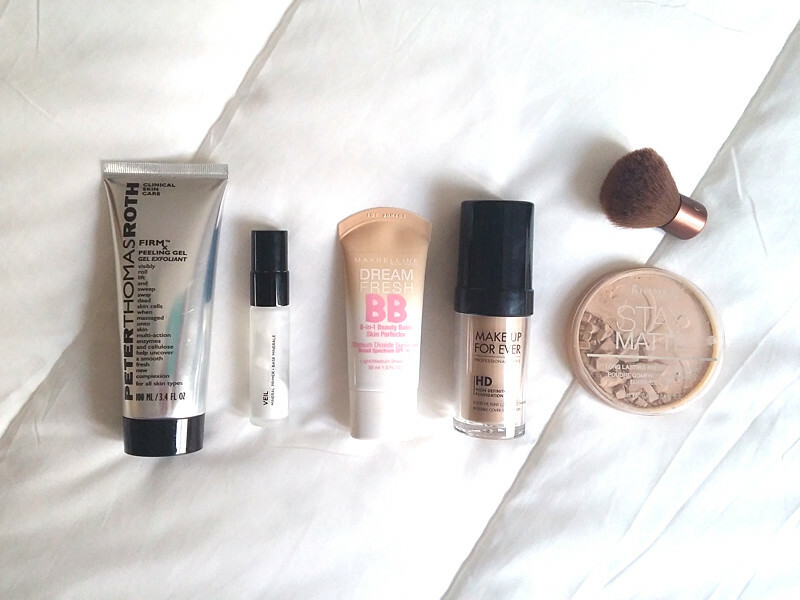 Makeup Forever HD Foundation: To be honest, I don't really know what I'm doing when it comes to foundation.... I bought this before a wedding last year to get more coverage than BB cream. It works, but I definitely don't use it regularly. Rimmel Stay Matte Powder: My face gets really shiny and oily around my T-zone. This helps. I totally dropped mine the first day I went to use it and I'm just too lazy to fix it. 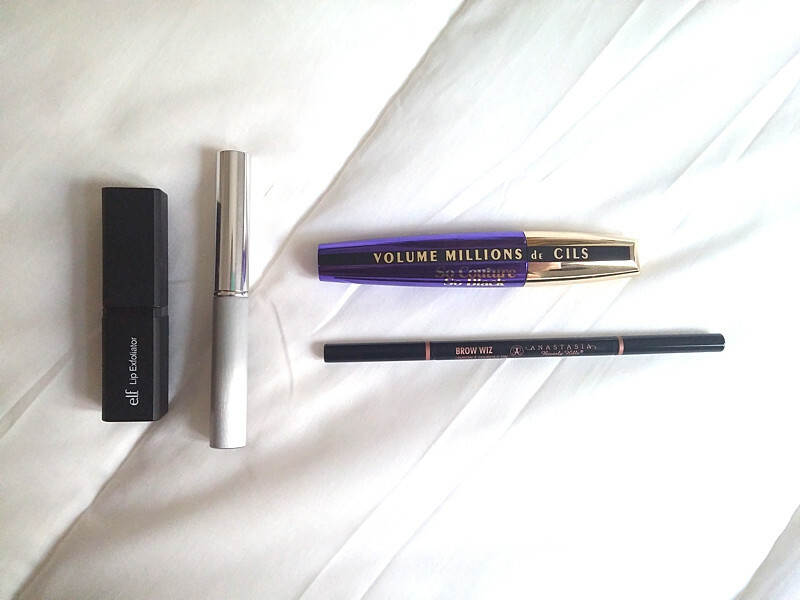 Loreal Volume Millions de Cils Mascara: You can't find this stuff in the US, which is a real shame because it is the best. My mom brought it over for me and I'm in love. Just the right amount of length and volume - I'll have to remember to pick another one up next month! Anastasia Brow Wiz: My eyebrows have been my latest foray into the world of makeup and a friend recommended this brow pencil to me. It is awesome, and I think I've finally got the technique down. My brows are on point lately! e.l.f. Lip Exfoliator: Because my lips are constantly chapped and peeling. This helps. I also dropped this the first day I got it and the stick fell out. I am clumsy as all hell. Clinique Almost Lipstick in Black Honey: I am super hesitant when it comes to lipsticks or anything on my lips in general, but this almost lipstick definitely changed my mind. Don't let the dark color fool you - it blends with your natural lip color to give you a shade that is all your own! I wear this more for special occasions than on the regular. Make Up Forever Sens'eyes Cleanser: The best eye makeup remover I have ever used. It gets the job done. What's your #1 recommended makeup product or brand? I'm still very new at this! Flats, Belts, & Bracelets, Oh My!